Multiple locations. Many hourly employees. Myriad pay rates and scheduled hours. Add multiple sick leave laws to the mix. The result: potential chaos and confusion. XpertHR can help. We take the complexity out of staying on top of the shifting paid sick leave law landscape to ensure compliance, understanding and clear employee communication. Michigan and Indiana are banning local sick leave laws. Cities from San Francisco to New York City are leading the pack in favor of them. 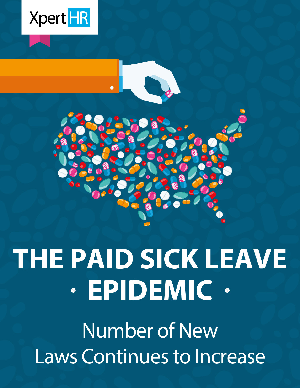 These and other states and cities around the country are creating a complex playing field for HR professionals when it comes to ensuring compliance with paid sick leave laws. You don’t have the time, or resources, to stay on top of these trends. We do! PLUS, you’ll get access to a 50-state chart, which is regularly kept up-to-date, and that breaks down the variability by state and municipality in an easy-to-digest way.